Do you have a PDF document on your Mac that is incomplete and you need to add more information to? 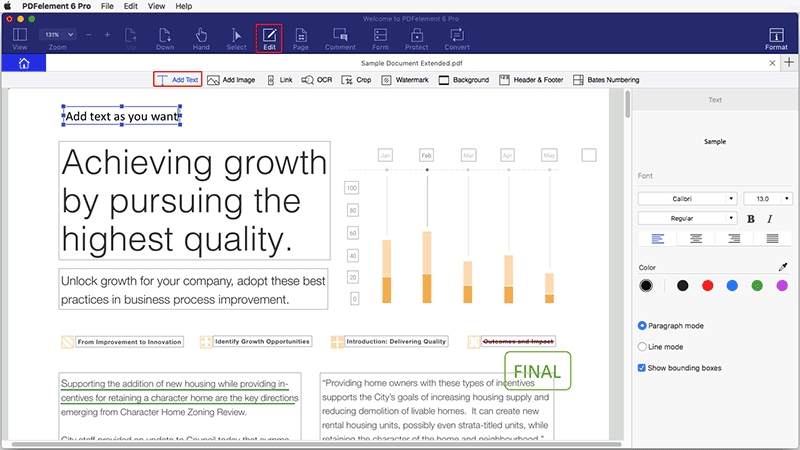 PDFs can be difficult to edit once all data has been entered and without the right tool, it seems nearly impossible to add text to PDF on Mac. No worries, in this article, we are going to share with you how to add text to PDF on Mac with PDFelement for Mac . While there are many out there that will allow you to minimally edit your PDF document online or from your Mac, only PDFelement for Mac is specifically designed to work on your Mac no matter the version of Mac OS you are running. The following are just some of the features that you'll get once you begin using it. With PDFelement for Mac, you can think Mac add text to PDF is very easy. The first thing you need to do is download and install PDFelement for Mac to your computer and when you're ready, follow these very simple steps to add text anywhere on the PDF document. Step 1. 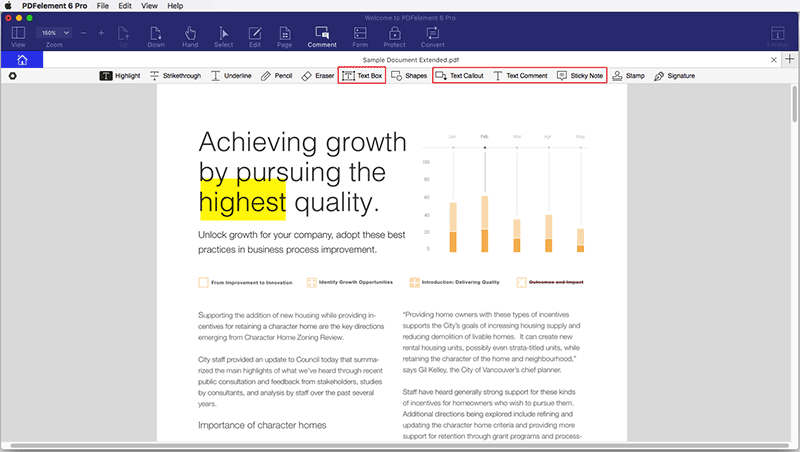 Click "Edit" > "Add Text"
The first step is to open the PDF document. Doing that is very easy. Just click "Open File" in the main window. You can then browse for the file you would like to open. Once the document is open, click on the "Edit" button and then select the option "Add Text". If you want to you can select the font, size, layout and color of the text to match the rest of the document. Simply select the text you’ve just added and from the right, select your preferred formatting. If instead you would like to add an annotation like a comment on to the PDF document as a way to give the document owner some feedback, PDFelement for Mac allows you to do that as well. Follow these simple steps to do it. Step 1: On the main menu in the blue area above the document, select "Comment" and then select "Text Box" from the resultant menu. Step 2: Click within the document where you would like the text box to appear and then go ahead and click inside the box to enter the text. If the PDF document you are working on is a form, PDFelement for Mac can also come in quite handy in helping you edit both the fields and the text on the PDF form. Here’s how to add text fields to PDF document for instance. 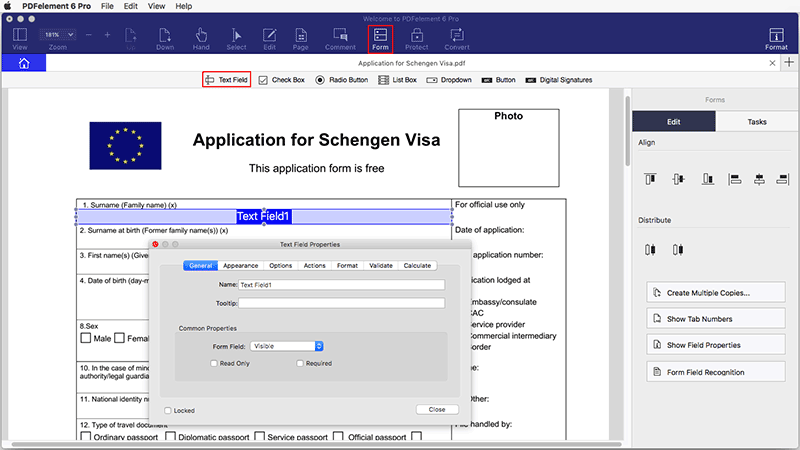 Step 1: Once the PDF document is open, click on "Form" in the main menu on top and then click on the "Text Field" button from the resultant menu. Step 2: On the form, click on the location you would like to add a new text field and the text field will be added. You can edit is accordingly. 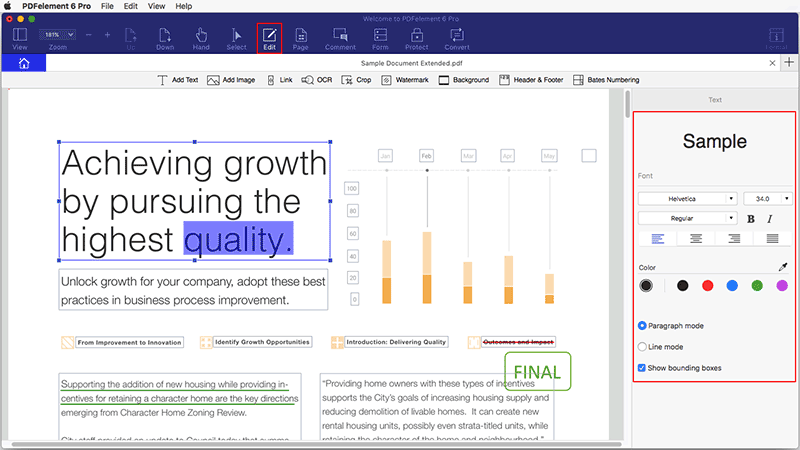 Step 3: once you are happy with the new text field, simply click on "Close Form Editing" to complete the process and don’t forget to save the changes you’ve made before closing the PDF document.